You can purchase the book directly at Editions de l'Aire in Vevey, at the Musée Jenisch Vevey, and at bookshops such as Payot in Lausanne, at the price of CHF 30.-. The launch of the book Pierre Aubert. 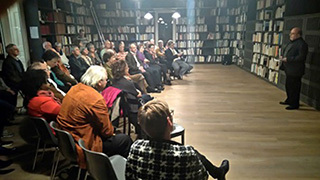 Journal d’un artiste took place on Thursday, 19th November at the Musée Jenisch in Vevey, and was attended by many guests. The book acquaints the reader with a part of the journal the artist kept towards the end of his life. It was presented in turn by Laurence Schmidlin, assistant director of the Musée Jenisch Vevey and curator at Cabinet cantonal des estampes; Michel Moret, director of Editions de l’Aire; Nicole Minder, president of the Fondation Pierre Aubert; and the artist’s son Raphaël Aubert, a writer. Would you like to obtain more information about Pierre Aubert?